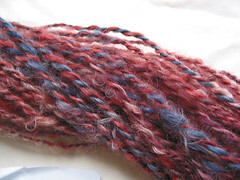 Notes: This was an easy knit. 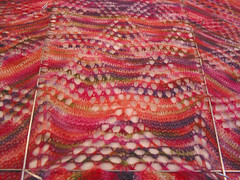 Because it's knit from the top down, you increase 8 stitches every other round; around 300 stitches, I was getting batty, took soooo long to finish 1 row! But, as with other monotony, I settled down, and the last few inches were no problem at all. 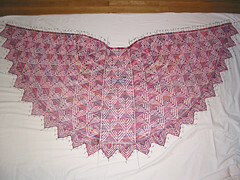 Also, with Myrna's shawls, you cast on invisibly and then pick up and graft stitches shortly after, so you get the nice continuous seed stitch border that goes around most of the shawl and only 2 ends to sew in. 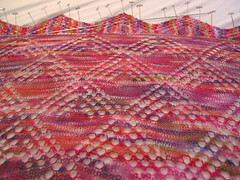 Blocking was time consuming and since it was my first blocked lace shawl, I really didn't know where to begin. The faroese shawls have a bit of shoulder shaping that helps the shawl sit on your shoulders, but that makes them a bit trickier to block. In the end, I started with the middle section, stretched it out good and tight, pinned the wing tips, and then stretched everything else 'til it was tight. 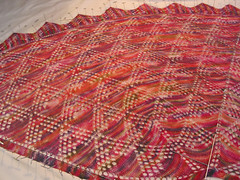 I love the colors in this pattern. When I chose the yarn I wasn't sure if the colors would obscure the lace, but after the first triangle I was pretty happy. The yarn on these needles was a good fit. 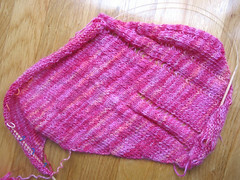 With the Hourglass Sweater done, I turned my attention to the Pink Clapotis. 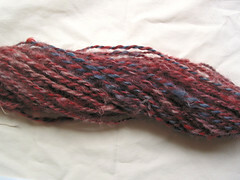 Because I was worried about running out of yarn, I frogged several inches and settled on a narrower scarf. Nope, it's not holiday knitting. Yes, I know, only a couple of dozen days to go, and plenty of projects left. Just. Can't. Do. It. Locks are fun. The colors are off, but you get the idea. No carding (don't own anything resembling carders), just fluff and go!